To paraphrase legendary TV and radio host Alan Partridge – crash, bang, wallop, what a videogame! 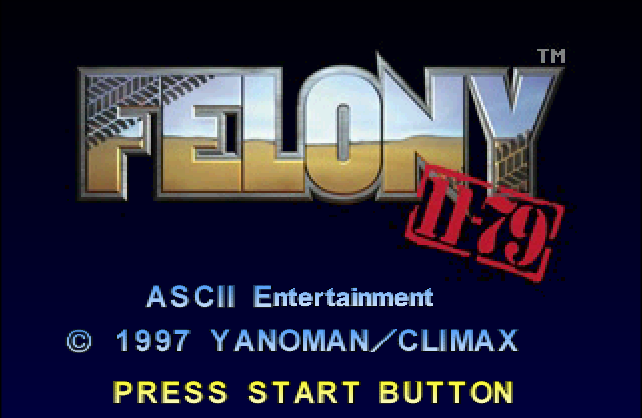 Strap yourself in and double - nay, triple – check your airbags, because it’s time for automotive insanity in Climax Entertainment’s 1997 Playstation Indiana-Jones-on-wheels-em-up Felony 11-79! I did check whether “11-79” marks an appropriate section of the US Penal Code and as far as I can tell it does not. 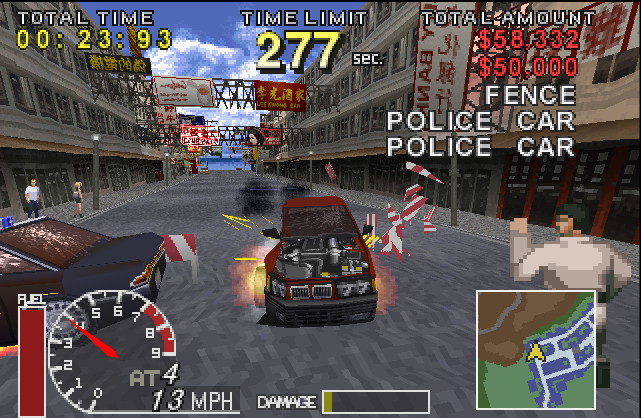 However, policecodes.net (which I’m sure is a totally accurate source for such information) claims that 11-79 is the radio code for “traffic accident, ambulance dispatched” and that definitely is appropriate for this game. I still don’t think Felony 11-79 is a great title, mind you. It implies that the police will be more involved than they are. The game’s called Runabout in Japan, which is an even less accurate title. “Runabout” brings to mind the cars that little old ladies use to tootle down to the shops in. So what would I have called this game? I dunno, Drive Fast and Crash a Lot or: How I Learned to Stop Worrying and Love the Pavement? Sure, let’s go with that. I played Felony 11-79 a bunch when I was younger, but I’d completely forgotten that it has a plot, which is narrated by someone who really should be hosting a knock-off Outer Limits-type anthology show. You see, in the sixteenth century an explorer found an ancient city of riches, including one mysterious casket that cannot be opened even though it’s modern times now and we’ve got pneumatic drills. 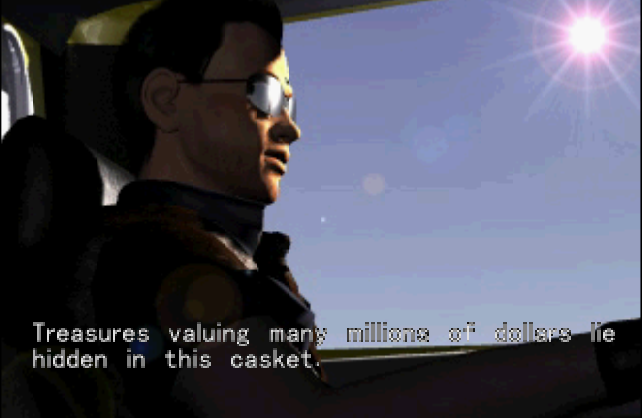 The casket ends up in the possession of businessman Albert Brookmond IV, who looks a bit like a rejected design for the final boss in an SNK fighting game. You could just imagine him attending the same gentleman’s club as Geese Howard and Rugal Bernstein. 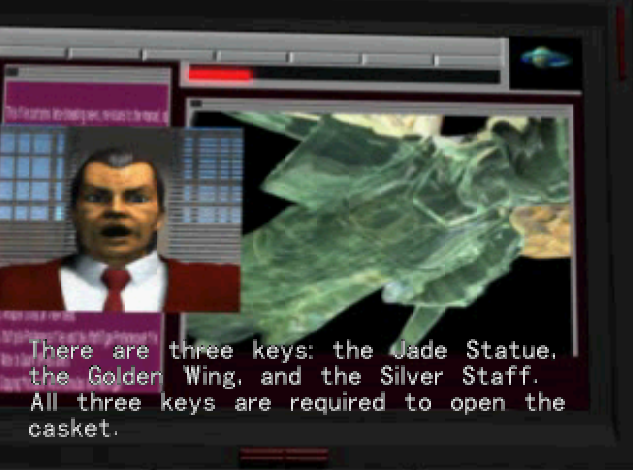 Brookmond discovers that there are three keys needed to unseal the casket and claim the treasure within – a jade statue, some golden wings and a silver staff. That’s where you, Mr. Runabout, come into it. The mysterious driver is hired by Brookmond to retrieve the keys on the basis that “he’s feared in the business world for his ruthless pursuit and disregard for the law.” I can’t help but notice that there’s no mention of his driving skills. 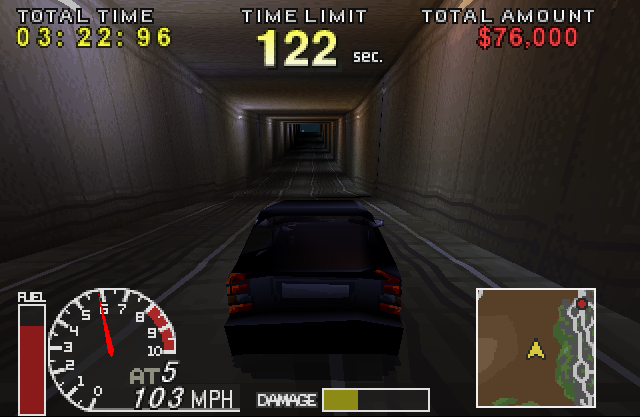 Felony 11-79 is a driving game, where you drive from one end of a semi-linear course to the other as quickly as possible… although there’s more to it than that, as we shall see. It’s definitely a straightforward game, though. 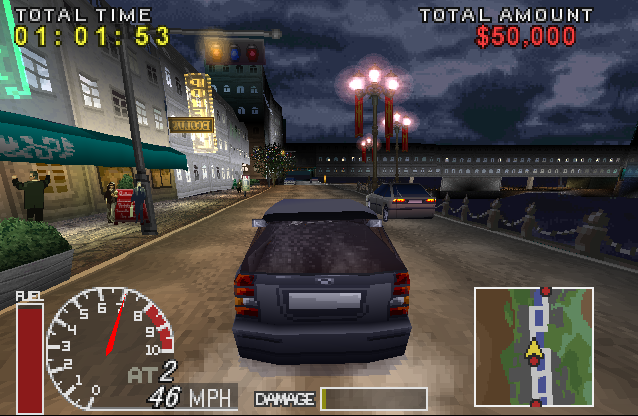 The first mission is Down Town, a mixture of city streets, beachside highways and mountain tunnels. You goal is to “Steal the Jade Statue and run for it!” which tells you how much planning has gone onto this heist. First you’ve got to select your vehicle, each of them with different strengths and weaknesses, including, y’know, strength and weakness. You start out with five vehicles that cover a decent variety of types, from this pick-up to a moped and a Mini. 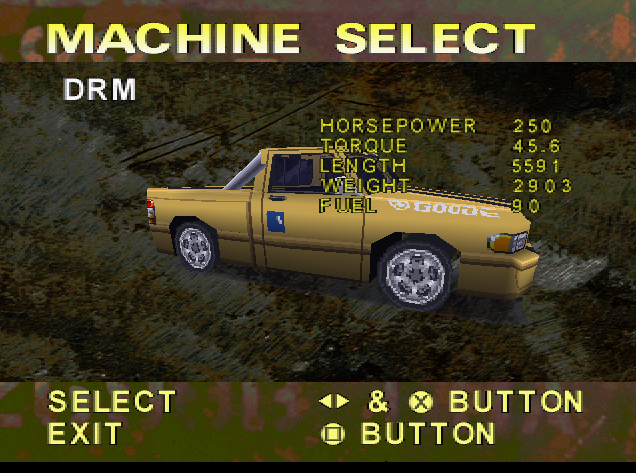 Given that it’s called the DRM I assume this truck is supposed to be a Dodge Ram, and it’s the Runabout series’ signature vehicle. I won’t be driving that for this first mission, though. In an attempt to stick to a middle ground between speed, handling and durability I’m going with the (I guess a BMW) 318. It’s the most average vehicle, so I’m not sure why the 318 isn’t the series’ lead vehicle. If cartoon and videogame have taught me anything it’s that the leader is usually the most average member of the team. Right then, so how are we going to steal this statue? Sneak in during the dead of night? Grapple up to the roof, disable the laser grid, blow the safe with C4? Or just crash straight through the front of the antiques store and grab the bloody thing. That’ll work too. This way you don’t have to worry about your driver getting spooked and leaving you at the scene of the crime. It’s genius, really. 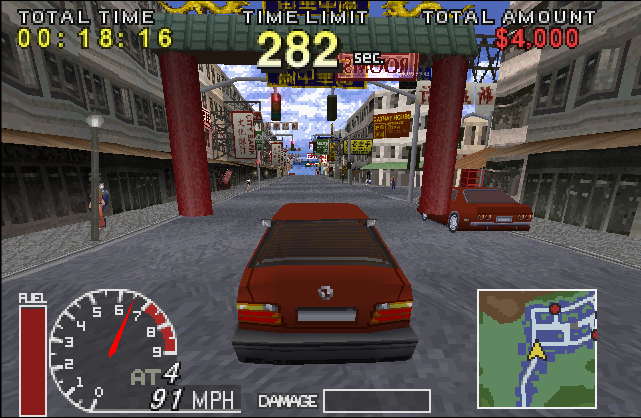 Take me down to the polygon city, where the textures warp and the cars are blocky. 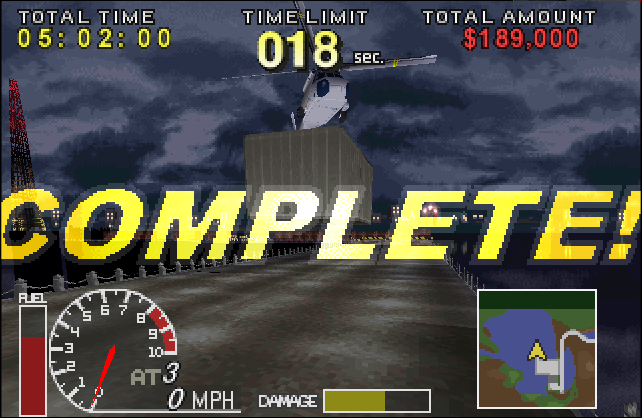 Okay, so Felony 11-79 might not be the most visually elegant game on the PS1, but if you’re playing the game properly you should be travelling fast enough that the graphics are hardly important. 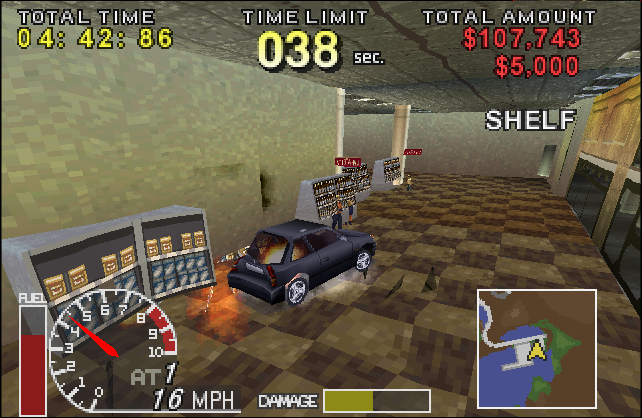 Controls-wise, Felony 11-79 is about as basic as this kind of game can get. You can accelerate, brake and steer, with a separate button for reversing. Some cars have manual transmission, so you’ll need to use the shoulder buttons to change gears in that case… and that’s about it. There’s not much in the way of special drifting techniques and no special items or weapons, just driving. And crashing. That happens a lot. Oh, and picking up object! Can’t forget that. 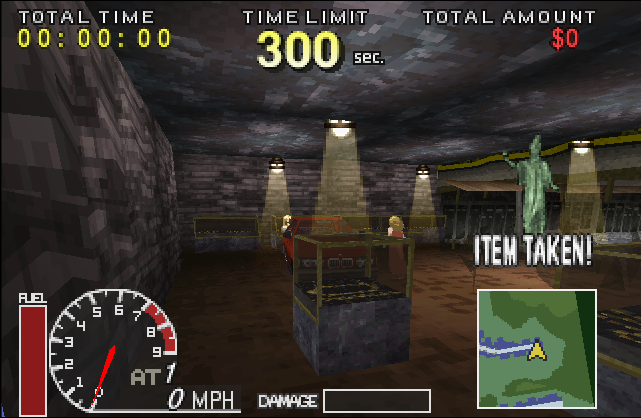 If you look at the minimap in the screenshot above, you’ll see some red dots representing sticks of dynamite that you need to drive over and collect because later on in the stage there’s a barrier that cannot by knocked down simply by driving right into it at 100 miles an hour. Don’t worry, that tactic is viable in a lot of other places. 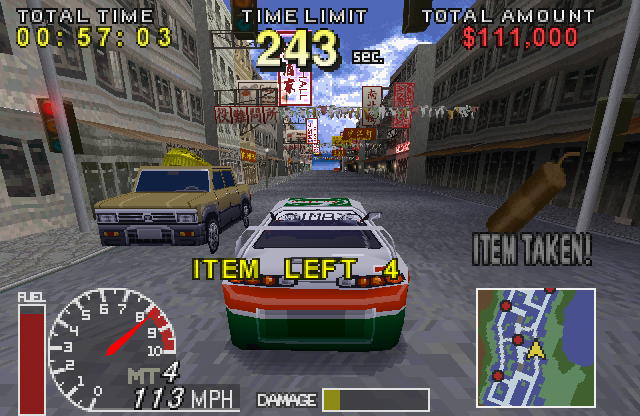 The dynamite is scattered across Chinatown, so you’ve got to pick your own route through the twisting streets while avoiding obstacles. Or not avoiding obstacles, if that’s your thing. 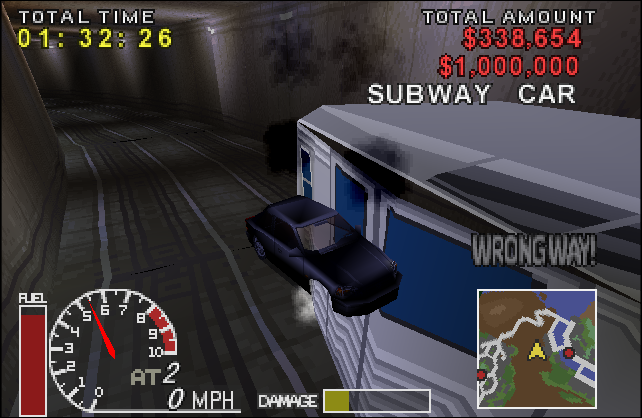 You get cash for crash in this game, with each collision rewarding you a chunk of change depending on the value of the item you’ve just wrecked, from $15 for a traffic cone to a million bucks for the player who’s willing to drive into a subway train. 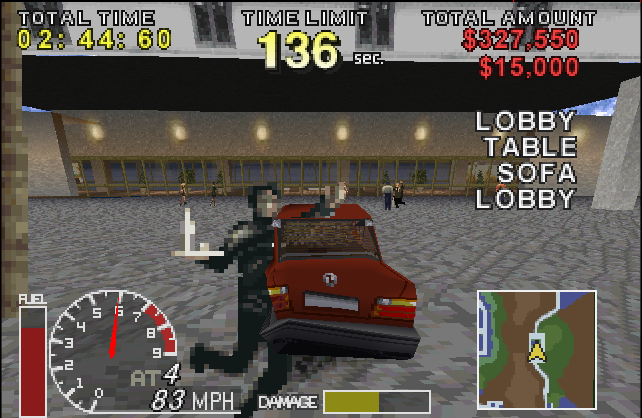 We’ll get on to the subject of money later, but beware: crashing into things also damages your car, and if the damage bar at the bottom of the screen fills all the way up it’s game over. 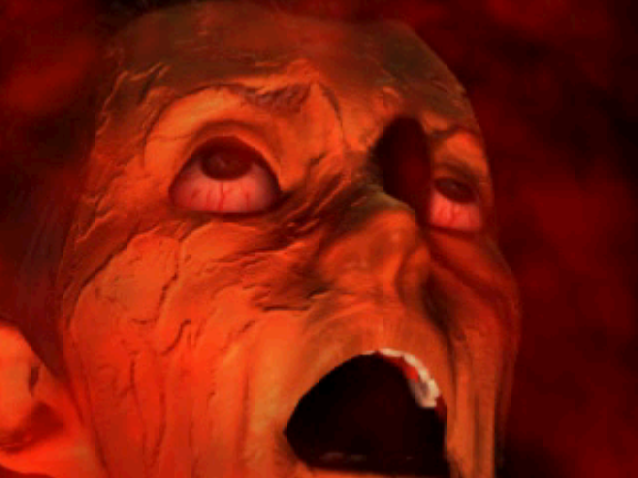 Felony 11-79 also handles the visuals of crashing in a way that feels pretty unique for the time. Rather than just showing your car from behind all the time, when you crash the camera takes a more cinematic bent, showing the carnage from a variety of different angles. Does this make it more difficult to orient yourself after a crash, especially a crash that makes your car spin across the road wiping out street furniture like the Incredible Hulk leaving his local after kicking out time? Yes, it does. But it also feeds into the idea of "cinematic," movie-style getaway driving, which is kinda what Felony 11-79 is all about. Having collected all the dynamite and travelled along the palm-fringed seaside road, we reach Private Place Michael. The gates are car-proof but not dynamite-proof. I suspect this is true of a lot of security gates in high-security luxury compounds, although if Michael really wanted to keep his place private he probably shouldn’t have built it right in the middle of a coastal highway. Once you’re past Michael’s place, the stage is all about pure speed, with wide-open roads and fewer obstacles so you can focus on maintaining a high top speed without scraping up against the canyon walls or crashing into a petrol station. 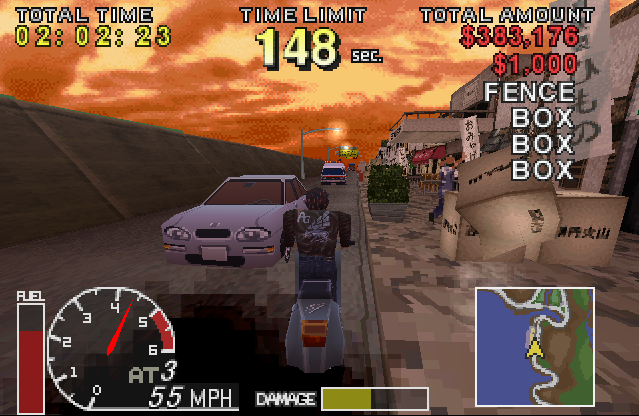 Technically the police are chasing you during this section, but if you’re driving anything but the very slowest vehicles (such as the moped) they never get close to catching you – and if you are on the moped you can get the police cars to ram you from behind. This does damage your vehicle, but it also instantly propels you from about 50 miles an hour to over one hundred and that can be helpful in its own way. Unless you’re facing a wall, of course. After some more highway driving I reached the goal. The pursuing police cars could not stop in time, crashed into a row of uncommonly sturdy oil drums and exploded. The jade statue is now in our “hero’s” possession. 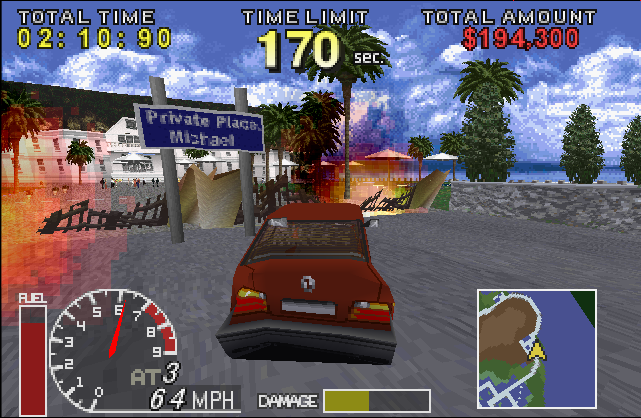 Michael is presumably on the phone with the insurers of his Private Place and I managed to reach the end of the stage without my car exploding. Well, apart from when I filled it with dynamite and rammed that gate, but you know what I mean. I suppose that means it’s time to move on to stage two. The second course is Sea Side, a sunset jaunt along, well, another coastal highway. There are a lot fewer urban areas in this one but consequently more traffic, so I decided to take the more nimble Mini out for a spin. A literal spin, given my driving skills and my panicked swerving as I tried and failed to avoid crashing into this toll booth. 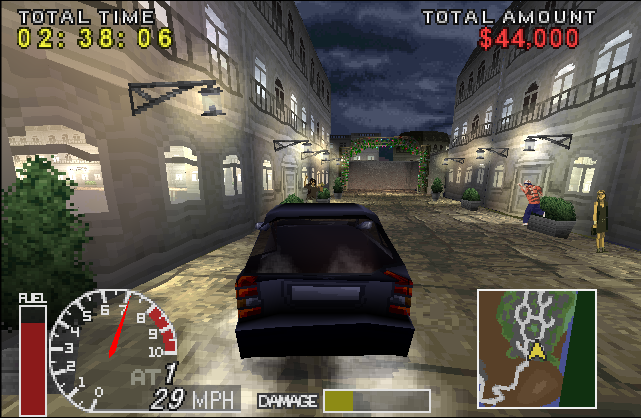 The goal of this stage is to steal the silver wings, which are inside a limousine that’s driving towards you from the other end of the map. You’ll generally meet the limousine in the middle of the stage. Yep, there it is. To steal the golden wings, you have to tail the limousine at a distance that doesn’t arouse suspicion until the driver stops for a break, at which point you can slowly drive up and grab the item in question. No, I’m kidding, you crash into the limo. 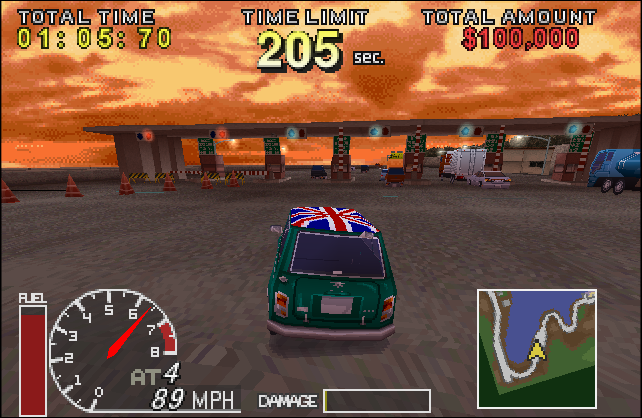 Head-on, if possible, because if you miss you’ll have to waste time turning around and chasing the limo down and the Mini is hardly the fastest car in the game, so every second counts. After grabbing the wings, presumably while shouting “yoink!” through a mouthful of shattered glass and scraps of airbag, the stage once again becomes a race to the finish. So far I’ve been talking about how Felony 11-79 works but it’s time to discuss how it feels, and the answer to that is, in my opinion, it feels great. I kinda love this game, honestly. It’s fast, extremely hectic and utterly unconcerned with anything approaching reality. It’s pure arcade-style action from start to finish, all wrapped up in a madcap shell of campy voice samples, wobbly pedestrian sprites that look like electrified inflatable tube men and pinball-inspired crash physics. 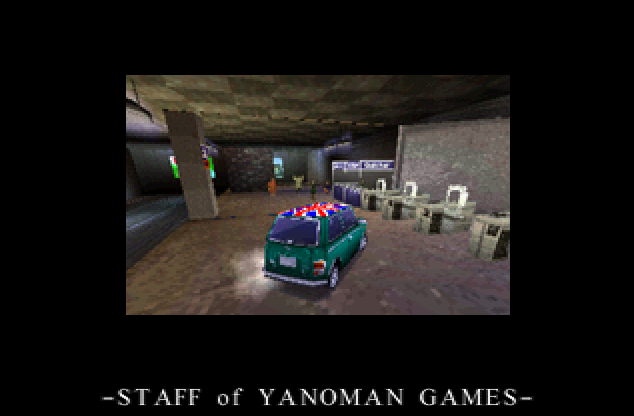 The driving itself is definitely what you’d describe as “unpolished,” but either through design or happy accident this only serves to compliment the game’s theme of driving like a maniac. A special mention has to go to Felony 11-79’s soundtrack – a collection of surf rock tracks performed by Japanese band the Surf Coasters. 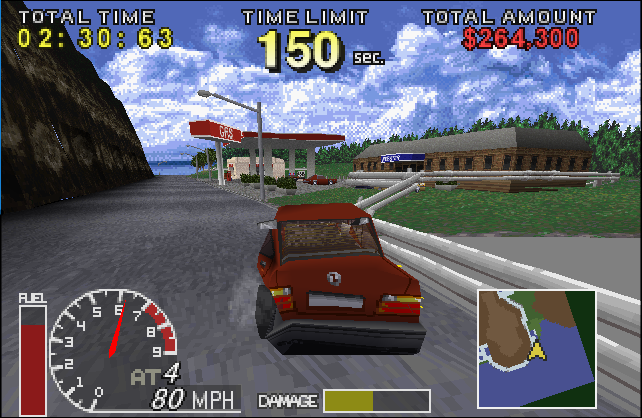 It turns out that the urgent guitar work and occasional organ riffs of surf rock is the perfect accompaniment to this kind of driving game. Who knew? Maybe I’m a little biased because I like surf rock in general, but I’d still say that the soundtrack is one of Felony 11-79’s strongest features. Here you can see me attempting to take one of the game’s many shortcuts. I swear, the bridge looked a lot less raised when I started driving towards it. I was hoping to be able to leap over the partially-open bridge and save some time, but alas. Now I know it’s there, though, and that’s a big part of the fun of Felony 11-79: finding all the alternate routes and shortcuts, of which there are plenty. If you go back to the previous screenshot you can see that I had a choice between a longer route, or a shorter path that can be faster, assuming you’re good enough to navigate through the large amount of other road vehicles. Good job I decided to bring the Mini, then. 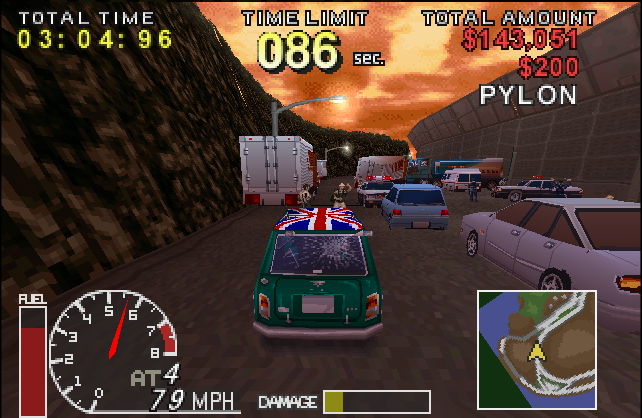 Felony 11-79 is at its best during these kinds of sections, where you've got a good turn of speed and you're slaloming between obstacles and smashing through billboards. It all comes together in a viscerally satisfying way, as all the most enjoyable racing games do when you squeeze through a dangerous shortcut. Stage complete, and golden wings acquired. The police cannot stop our mysterious driver. Not with threats of legal punishment, not by chasing him down and not even by physically blocking the road. I don’t know what that cop at the top thinks he’s going to do; beat our car to a halt with his truncheon? His superior officer must be near by and he’s just trying to look busy. After clearing the first two courses, you unlock the third and final stage: Paris. That’s right, there are only three courses in Felony 11-79. It’s a very short game… if you’re just trying to get to the ending. There’s more to the game than that, though. 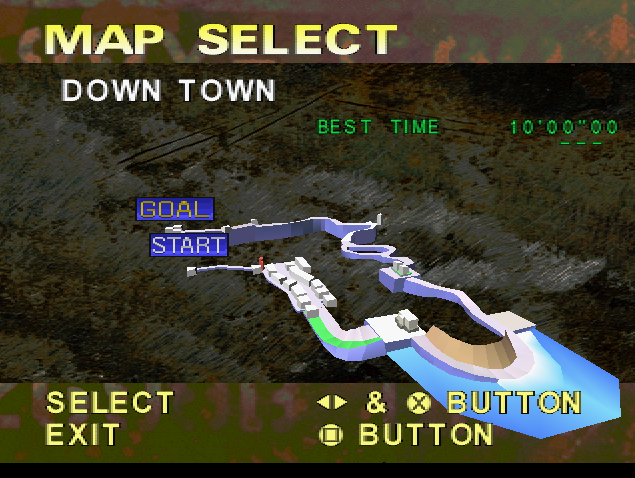 As mentioned, there are plenty of hidden shortcuts to find, and you can always try to beat your high scores: there’s even a separate time trial mode. Plus, there are a bunch of extra cars to unlock, ranging from more powerful “normal” vehicles and rally cars to more interesting offerings like a city bus, a remote controlled car and a goddamn tank. 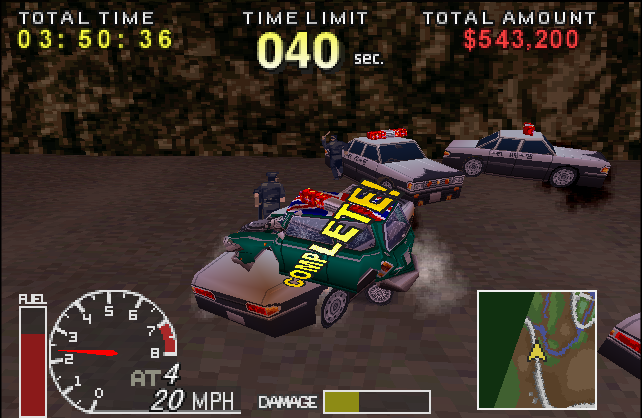 The extra cars are unlocked in a variety of ways; sometimes by just clearing a stage, or by racking up a certain amount of cash by crashing into lots of things. Some are less easy to unlock, like the ones that require you to finish a stage without taking any damage. I regret that I will not be able to show you any vehicles unlocked via that method. Getting through a Felony 11-79 course with no damage is like trying to get through your friends’ Facebook feed without the feeling the existential dread that everyone is doing way better than you. Back to France, and the mission has a slightly unusual set-up this time. You’ve got to find the silver staff, which is hidden in a statue. Crash into the statue to get the staff, naturellement. However, you also have to hit a telephone booth in order to summon your extraction helicopter, and the phone booths are everywhere. You can see a bunch of them on the map here, often placed in awkward, out of the way places, and the first time through this stage I wasted a bunch of time travelling backward to investigate these dots in case one of them was the statue. 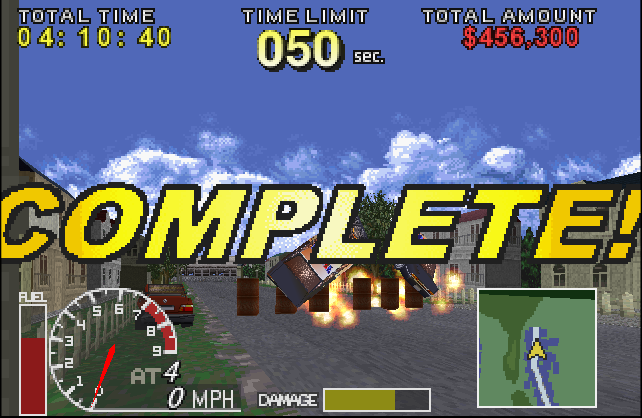 As it turns out, you can just ignore them and hit a telephone booth much later in the stage. 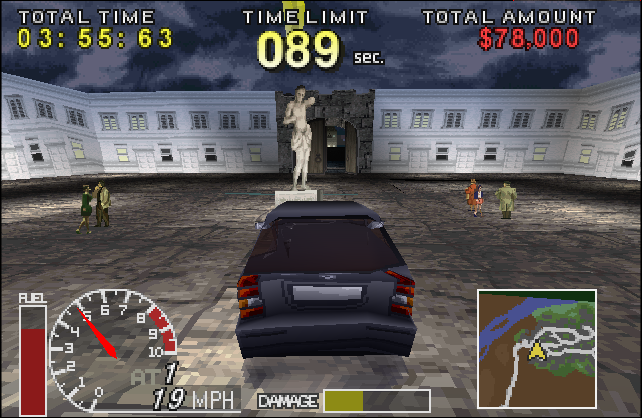 The statue is actually located at the far end of the game’s trickiest section: a maze-like warren of twisting paths and dead ends full of Parisian glamour and smashable flowerpots that don’t half slow your car down. It’s a nightmare to navigate at any kind of speed. Good job you can avoid it by driving into the tunnels of the Paris Metro, really. Of course, getting your car back out of the subway is tricky, but it’s still faster than than negotiating Labyrintheville. There’s one other major drawback to travelling via the subway, of course. Can’t argue with one million dollars, I suppose, but hitting the subway car did seem to ram me five hundred meters back the way I came, as you might expect. Swings and roundabouts, as they say. I’ve found the statue and obviously I crashed into it, so now all I need to do is hit a phone box and dash towards the docks where the helicopter will be waiting to pick me up. From here it’s mostly smooth driving – and the opportunity to drive through a river, if you like – until you reach the docks. Unfortunately some inconsiderate fool built a supermarket right in front of the docks, and you must drive through it to reach the goal. I imagine the driver is used to this. He didn’t bother getting out of his car to steal the priceless artefact, so why would he do so when he’s stocking up on toilet roll and chocolate biscuits? I can just see him blasting through Aldi, hanging a basket out of the window to scoop up tins of hlaf-price chicken soup. Away I go, carried off in a shipping container that I hope someone thought to poke breathing holes into. That marks the end of Felony 11-79’s story mode; a mode that ended too soon. I was having a lot of fun with it, and I wish the game did have more courses. Oh well, we’ve got the ending to look forward to, at least. It’s not a long ending. The keys are assembled, Albert Brookmond IV opens the casket and immediately gets his face melted off, Raiders of the Lost Ark style. 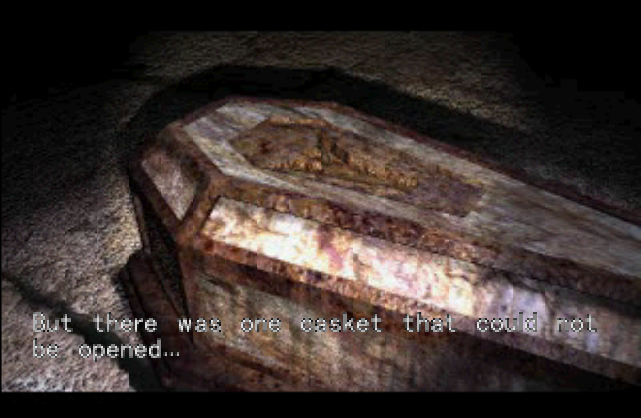 The casket is shown to be full of gold coins, though, so maybe Brookmond simply wasn't pure enough of heart to receive the trasure within. That hubris, that is. 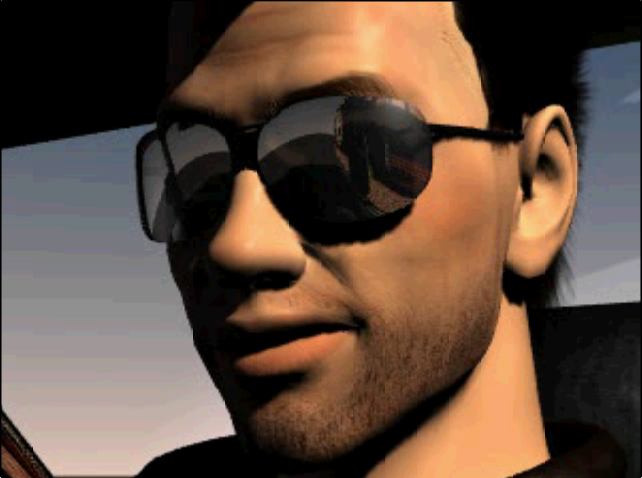 The driver looks real smug about this turn of events. He must have been paid in advance. Game over! And what a fun little game it was. Something of a minor hidden gem, I’d say, and quite possibly that most arcade-y videogame I’ve ever played that wasn’t, you know, an arcade game. Felony 11-79 is one of those games that picks one thing to do and does it in a way that’s wholly it’s own, resulting in an experience that’s by no means perfect but which possesses a certain energy, a sense of uniqueness, that I can’t help but find very appealing. The negatives are significant enough to make Felony 11-79 fall a long way short being a true classic, of course. Technical issues with messy (and sometimes downright ugly) graphics and occasionally frustrating camera twirls can make the game a bit of a pain at times, especially when the random nature of the crashes causes you to lose more time that you ought to because you can’t see how to extricate yourself from the twisted wreckage. The controls can be slippery, and it's surprisingly dificult to get your car driving in a straight line rather than veering across the road. Then there’s the crashes themselves. 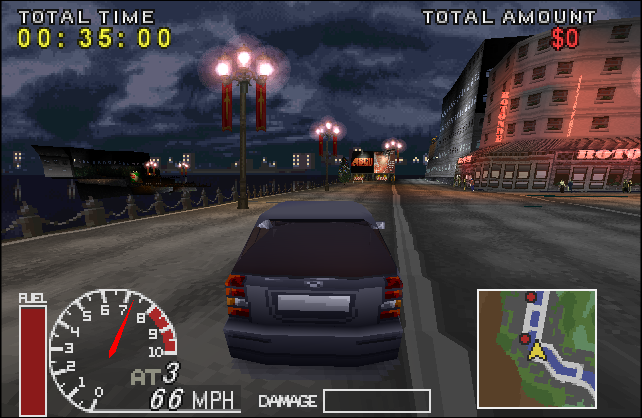 Smashing into every available object, vehicle and roadside decoration is a big part of Felony 11-79's appeal, but this does mean that the slightest contact triggers a “collision” and the game would play a bit more smoothly if this wasn’t the case and, for example, gently rubbing the side of another car as you pass it didn’t cause it to explode. 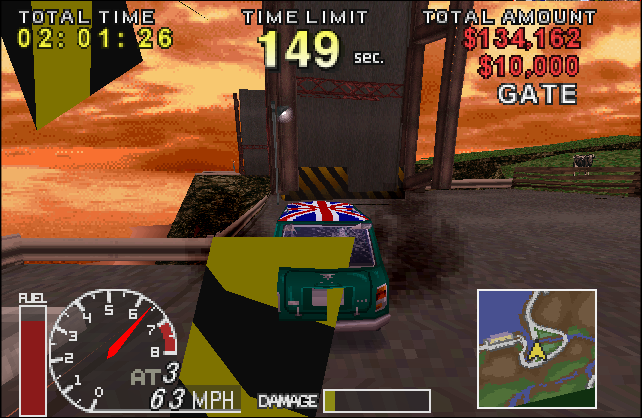 It doesn’t help that the hitboxes (especially on the cars) feel very big and, well, boxy; I had plenty of crashes where I was sure I’d avoided the obstacle in question but the hitbox decided otherwise. None of that stops Felony 11-79 being a ton of fun to play, though. Unlocking the secret vehicles gives the game some much-needed extra longevity, and I like how the game’s various meters and scoring systems come together. You need to get to the goal within the time limit, but you might also want to score lots of cash… but your car can’t be allowed to blow up, so you’re playing those three things against each other. You choice of vehicle also factors into this, as you decide whether to take something like the city bus that can ram its way through any traffic jam but isn’t exactly nimble or maybe plump for the Vespa scooter, which is so small it can find extra shortcuts. All this adds just enough complexity to “drive fast” formula to keep Felony 11-79 interesting beyond the initial novelty of playing a driving game that hands out cash prizes for crashing. In short, I love Felony 11-79 and all its goofy charms. You should give it a try. It’s also got a few sequels, including one on the 3DS, so maybe I’ll check those out at some point. 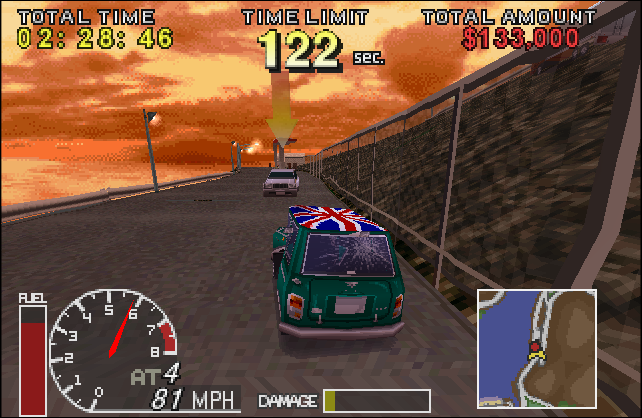 For now, though, I’ll crank up the surf rock and try to get the hang of some of the cars in this game that are manual transmission only. And you though I crashed a lot before. Minigames and anime laundry in Got-Cha Mini Game Festival! Dangerous skiing and rude billboards in Extreme Downhill! Sunburned Dragons and gingerbread horror in Slightly Magic! 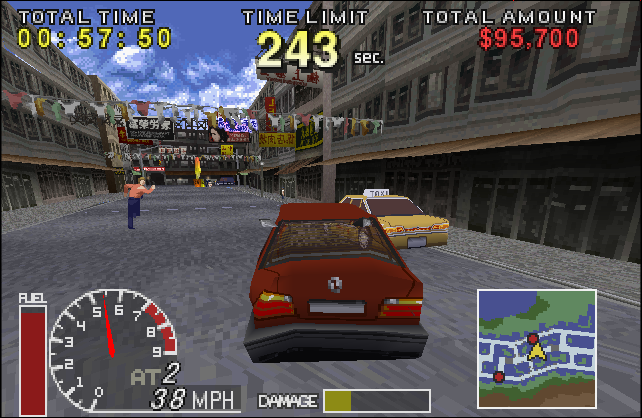 Still trying to determine if this game is any relation to Wreckless: The Yakuza Missions and its sequel Double STEAL: Second Clash. I'd be utterly floored if there wasn't a link somewhere. I hope Private Place Michael gets promoted to Major Place Michael. Is this the game with a playable Gunhed?